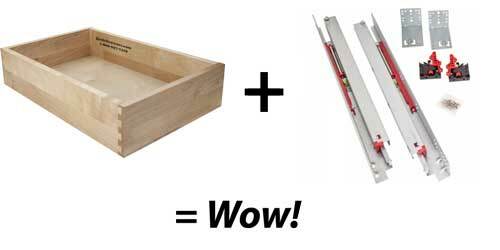 Drawer & slide combination that "ticks all the boxes" at an incredible price. 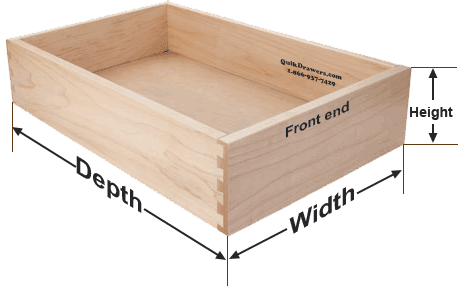 Quikdrawers 5/8" solid Birch or Natural Hard Maple drawer box program designed for any drawer or pullout/rollout shelf need. These pre-finished drawer boxes can be ordered with a variety of options, just scroll down this page for more information. Drawer boxes are constructed with 5/8" thick pre-finished solid wood sides, dovetail joints on all four corners and a standard matching 1/4" thick B-3 grade plywood bottom. 1/2" bottoms are available as an upgrade. All material used is of Standard Grade and will consist of natural colors of the species selected. Mineral, color and grain variation is allowed and some finger joints may be visible (on top/bottom edge only). Some companies will tell you that dovetail joints, solid wood and a UV clear coat finish is not important... That's because they can't offer it, especially at these prices! All bottoms are recessed 1/2" and all sides have 1/16" eased edges. Drawer boxes are shipped pre-assembled. Notching for undermount slides is available (release clips are not supplied unless ordered with our Vitus Under-mount slide). 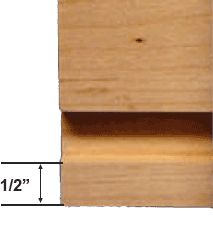 We strongly recommend a 1/2" thick bottom if your drawer box or rollout shelf is 24" or wider. Every drawer and rollout is branded... your guarantee of quality! 8", 9", 9.5", 10", 11" & 12"
Maximum height for rollout and high back rollouts is 12"
Our Standard drawer is designed for new construction or replacement of missing or broken drawer boxes. Our Rollout drawer is designed for any storage need and with the attractive scoop cut, "galley handle" can be used in stacks and under counter applications. Our High Back Rollout drawer has feature of both the standard drawer box, rollout drawer box and adds the "High Back" option for applications where you may be concerned about pullout shelving contents tipping over. Regardless of selected rear height, the front will always be 3" high, allowing for easy viewing of the contents. *Scoop handle is 1" x 5" and is standard with Rollout or High Back Rollout boxes. **When ordering the high back drawer, the height of the box is the rear "high side" and has a minimum of 6". The front is 3" regardless of rear height . 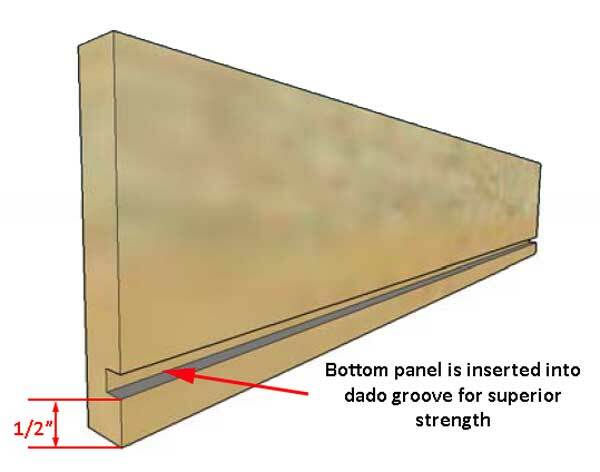 Optional undermount notching is based on standard manufacturers requirements (1-1/2" wide) and is only available as shown below. (Selecting this option above does not include the slide) We do NOT offer or perform custom notching or boring. Our standard drawer box lead time is just 7-10 work days and may be affected by workload and other conditions not under our control. This is not a guarantee of production timeframes. 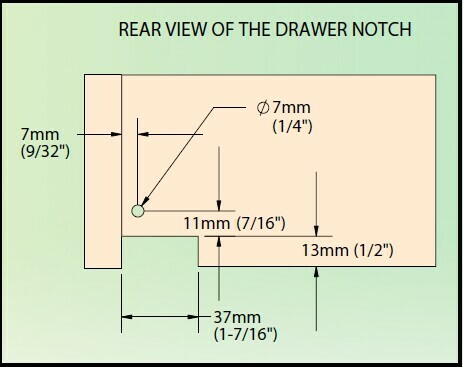 You may choose to include the optional screws for attaching your drawer front to your drawer. If you do, please read the Drawer Front Screw webpage for important information. We do NOT drill the holes in the drawer for your drawer front screws. QuikDrawers Lifetime warranty is for defects in materials and craftsmanship for the original purchaser. 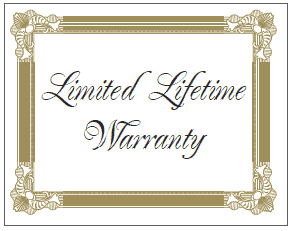 This limited lifetime warranty for QuikDrawers custom drawers has specific conditions and exclusions. Please see Warranty Information page for details. *Some conditions apply. Drawers may not be combined with other items for free shipping. Products purchased along with drawers will be charged appropriate shipping for those items. Contact Sales for other details.